The massive sundeck stretches the full length of the house and opens out to the expansive view of the buzzing city. Just steps below the deck, a glorious pool shimmers in the California sun. Mr. R. and Miss A. relax at a large, round table that is dressed in the requisite white linen and crystal. Lauren reads a script in a sunchair next to them. Miss A. stretches her bare, pedicured feet into the sun. I guess any day here feels like Spring when you’re from Manhattan. 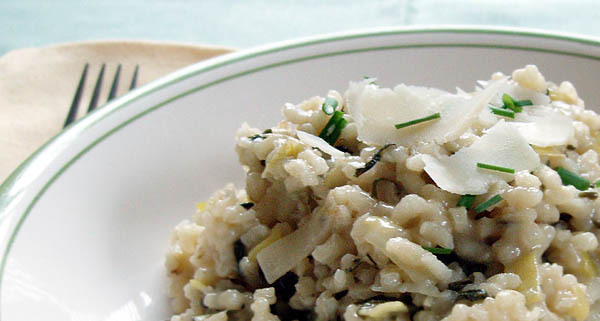 MR. R. smiles at the thought as Caryn enters with plates piled high with hot, green-speckled risotto. Lauren comes over to the table as Caryn pours sparkling water into the glasses. Miss A. wastes no time before digging her fork into the steaming mound. Oh, it’s sort of a light risotto. Arugala, leeks, parmesan. Mmmmm. Perfect dish for a beautiful day! Lauren resumes reading her script without touching her lunch. Mr. R. eats in silence. Caryn takes the opportunity to sneak away. You’re right. Your chef is really good. Lauren looks up from her script to Mr. R. who continues to eat. She’s alright. Not the best you’ve ever had. Mr. R. dismisses Lauren’s comment with a laugh. The table falls silent as the trio drifts off into their thoughts of the afternoon. Around the corner, Caryn sits on the back steps, disappointed with the previous conversation from the deck. She stretches out her home-pedicured feet into the sun and tries to disappear into her own plate of risotto. 1. Bring stock to a gentle simmer. 2. Heat oil over medium-high heat in heavy-bottomed pan. Add leeks and garlic. Saute until soft, about 5 minutes. Add rice and stir until rice is nearly translucent, about 3 minutes. 3. Add the wine and stir until it is completely absorbed. 4. Slowly add 1 cup of the stock to the rice, stirring constantly. 5. When the stock has been nearly absorbed, add the arugala, chives and thyme. 6. Continue to add the stock a ladleful at a time, stirring the rice constantly, until the rice is just tender and looks creamy, about 20-25 minutes. 7. Stir in the parmesan and salt and pepper. Serve at once. 3 lunch-sized portions, and a little leftover. Caryn and Flora are trimming and washing a bed of fresh, spring greens over the sink when the door swings open and MISS A., a stunningly beautiful actress in a white, flowing sundress, prances in. He said I’d find you here. What are you making? She is cut off by the door swinging open again. Mr. R enters, visibly tired from his travel, but smiling warmly at Miss A. He nods to Caryn without taking his eyes off of Miss A.
Caryn, I see you’ve met my houseguest. She was just helping me find lunch. Caryn puts down the greens and wipes her hands dry. Perhaps a light dressing. That’s all. Mr. R. gently puts his hand on Miss A.’s sleek, exposed back and leads her to the door. They are almost through the door as Miss A. calls back. Her giggle is muffled when the door swings closed again. Flora can’t help giggling herself. Caryn takes some bottles with Chinese writing out of the cabinet. My daughter has seen all her movies. I might have seen one on an airplane or something. She drizzles a little from each bottle into a small bowl. Flora resumes cleaning the greens. Caryn whisks the vinaigrette with a vengeance. 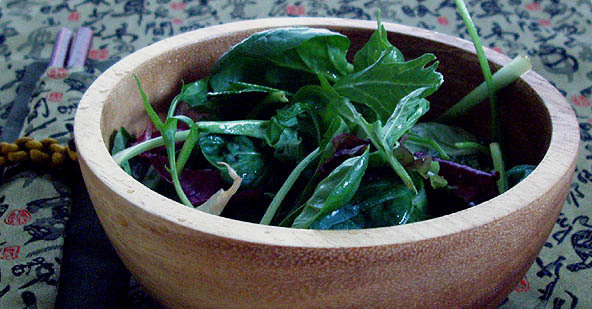 A small amount of sesame oil adds tremendous depth to this vinaigrette. It needs nothing more than an assortment of baby greens to accompany it. The sink is overflowing with dirty dishes and bowls. Bright orange spots are spattered around the stove. The trash can is long overdue for a changing. Caryn stands over a colorful bowl on the table, digital camera poised at her eye. There is a quick knock at the door, but it opens nearly at the same time and Matt waltzes in. Smells like peppers in here! Matt leans over the table to look at the bowl. Dip. Didn’t know you were coming over. Matt picks a pita chip off the counter and starts to munch on it. Wasting some time before my date. Caryn repositions the food and snaps another picture. It’d kill you to show up on time? No one. Just an experiment. Perfect. Then I’m your guinea pig. He grabs the chip that sticks out of the bowl and scoops a generous portion of the silky dip before popping it in his mouth. Good thing I’m done taking pictures. He walks over to the fridge and grabs a half-full bottle of pomegranate juice. I know. I might have added more jalapenos than it called for. I think it chapped my lips. This flavorful dip was designed as an entry for the Paper Chef #4 using the following ingredients: eggplant, stale bread, chocolate and pomegranate. The use of three different kinds of peppers somehow brought those flavors together. 1. Rehydrate tomatoes in boiling water. Drain and reserve liquid. 2. Toast pepitas, almonds and sesame seeds in a dry skillet until lightly browned. Cool. 3. Grind seeds and almonds in food processor until fine. Add tomatoes, chipotles and pomegranate juice. Puree until smooth. 4. Heat oil in a skillet over medium heat. Add garlic and saute until soft. Add the pureed mixture and saute until thickened (about 15-20 minutes). 5. Melt the chocolate into the mixture. 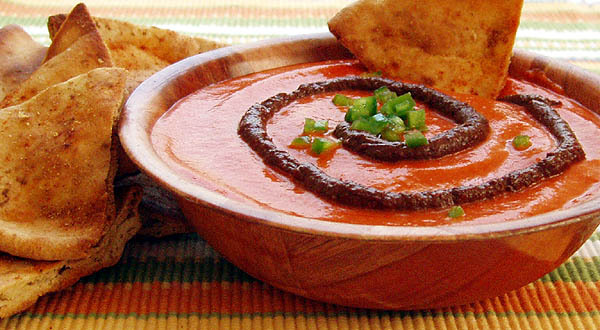 Thin sauce with reserved tomato liquid until desired consistency (I used 1/2 cup). Simmer for a minute to blend flavors. Makes about two cups. Refrigerate until ready to use. To use as a sauce for meats or vegetables, use only one or two of the chipotles and thin the finished sauce with chicken broth. Vary the chocolate to taste. 2. Brush the pita with olive oil and cut into halves and then thirds to form wedges. 3. Dust with cumin and paprika. 4. Bake on a cookie sheet until golden and crispy (about 20 minutes). Waves of a dark ocean crash onto the rocks of a deserted beach, protected by the sandy hills lumbering high overhead. At the top of those hills, fields of green crops stretch out to meet the early morning sun. The crops, though, are not alone. Eager CROP WORKERS are lingering between the aisles, ready to get to work. One FARMER walks with his BROTHER. The two men stop to examine the crop. The farmer bends down and gently cups the pointed leaves of a fresh, round artichoke. He slowly pulls it aside to reveal smaller, seemingly fragile baby artichokes hiding from the light beneath their mother. He looks up at his brother, a broad smile creeping across his face. A sharp, machete-like knife hacks at the base of the baby chokes and they fall softly to the ground. A sharp kitchen knife slices right through the heart of a baby artichoke, the halves instantly starting to brown. Caryn sings along to the pop song blaring from the stereo as she methodically cleans the artichokes, dowsing them with lemon juice every few seconds. Water simmers in a pot on the stove. Soft butter waits in a small saute pan. The unusually warm breezes blow through the screen door. It is February in other parts of the country, but not here. A stem rolls off the counter and Punky chases it under a desk full of cookbooks and papers scattered about. She is planning something. 1. Juice half of a lemon into a bowl of cold water. Cut the other half into wedges for the cleaning of the artichokes. 2. Clean the artichokes by peeling off the leaves until the yellow, tender leaves are revealed. Cut a 1/2″ off the tops (the green part) and cut off the stem to 1/2″. Peel the remains of the leaves off the stem with a knife. Slice the artichokes in half and rub them with lemon to keep from browning. If necessary, use the pointed tip of a vegetable peeler to scoop out the fuzzy centers. Drop the halves into the bowl of water. 3. Bring a medium-sized pot of water to boil. 4. Drain the artichokes and drop in boiling water. Boil until tender, about 5 minutes. Drain. 5. Melt butter in small saute pan. Add drained artichokes and season with salt and pepper. Saute for 3-5 minutes. 6. 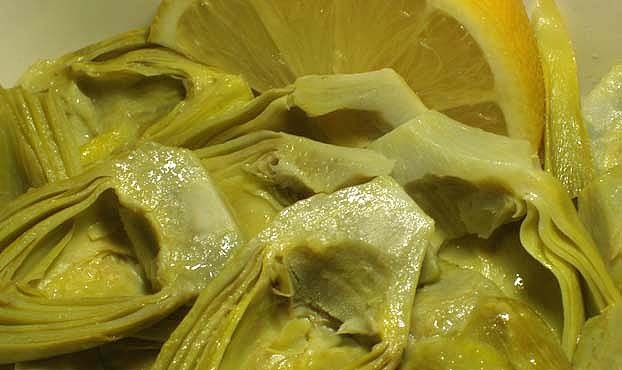 Squeeze juice of remaining lemon half (or whole) over the artichokes and saute for 1 minute more. Serve with lemon wedges. Caryn weaves the old Honda through the ever-present traffic of the city. It was a nice car in its day, but that day has long passed. She turns the radio up to drown out the noise of her brakes as she squawks to a halt at a red light. The MAN in the polished Mercedes next to her scowls at the Honda, baffled that any car can make the exact noise of an ailing heifer. Caryn turns away to avoid eye contact when she spots a sign on her left that reads “La Brea Bakery.” She sits up in her seat. The light changes, but Caryn whips her car between oncoming traffic and into the valet parking lot of the bakery. She hops out and dashes to the store, calling back to the valet ATTENDANTS. I’ll only be a minute! The attendants shake their heads in wonder, but before they can gripe, she returns and is squawking the car back into traffic. She can’t wait. She opens the bag from the bakery to reveal a loaf of bread that looks like any country loaf. But when she tears off an end, soft, perfumed cloves of garlic appear from their hidden caverns inside. Caryn nibbles on her bread as if it was her only ration for the week. A pile of tomatoes drains on the counter while Caryn minces fresh garlic. A buzzer on the fridge goes off and she dashes to the oven to remove a cookie sheet of small bread slices. Olive oil has painted the surfaces of the toasted slices a tender green. Punky paces the area around his food bowls, occasionally letting out a piercing MEOW to let Caryn (and the neighborhood) know that he is hungry. Caryn puts the bread slices piled high with cheese and a tomato mixture in the oven. It is no time before she pulls the cookie sheet out again, the bruschetta now glistening with the tomatoes and the cheese lovingly melted over the sides. 2. Peel, core and chop the tomatoes. Lightly salt the chopped tomatoes and place in a colander. Set colander over a bowl to catch juice. Let sit for 30 minutes. 3. Slice loaf into 4 thick slices and then cut slices in half. Depending on the size of the loaf, slices should be a little larger than bite-size. Brush olive oil on both sides of the bread and place the slices on a cookie sheet. Bake until lightly toasted, about 5-10 minutes. 4. Cut mozzarella into slices to fit each bread slice, up to 1/4” thick. 5. Mix tomatoes and garlic together and drizzle with a little olive oil. 6. 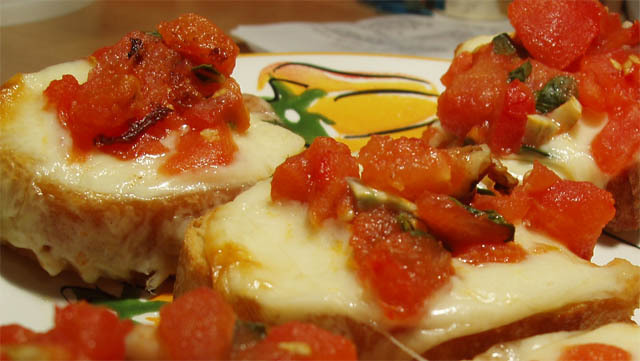 Top each toasted bread slice with mozzarella and a generous spoonful of the tomato mixture. 7. Bake until cheese melts and begins to brown, about 10-15 minutes. It’s okay to boost the oven temperature a bit to decrease cooking time—just make sure the bread doesn’t burn on the bottom. **Whole-milk mozzarella melts faster and more evenly than part-skim, which means it starts to get that brown, bubbly crust before the rest of the food becomes overcooked.